Since about the 1970s, there has been a decrease in total volume of the Ozone in the ozone layer, of about 4%, per decade. There are seasonal variations in the ozone layers; in springtime, there is less ozone in the ozone layer over the polar regions, esp. the south pole. This is generally known as ozone hole. In addition to these well-known stratospheric phenomena, there are also springtime polar tropospheric ozone depletion events. The details of polar ozone hole formation differ from that of mid-latitude thinning, but the most important process in both is catalytic destruction of ozone by atomic halogens. The main source of these halogen atoms in the stratosphere is photodissociation of man-made halocarbon refrigerants (CFCs, freons, halons.) These compounds are transported into the stratosphere after being emitted at the surface. Both types of ozone depletion were observed to increase as emissions of Halocarbons increased. CFCs and other substances contributing to this effect are referred to as ozone-depleting substances (ODS). 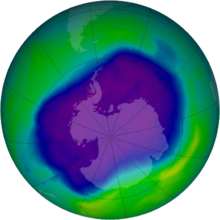 Since the ozone layer prevents most harmful UVB wavelengths (280–315 nm) of ultraviolet light (UV light) from passing through the Earth's atmosphere, observed and projected decreases in ozone have generated worldwide concern. As a result, the Montreal Protocol has been adopted. The treaty bans the production of CFCs, halons as and other ozone-depleting chemicals such as carbon tetrachloride and trichloroethane. The biological consequences of this change in ozone levels may include an increases in skin cancer, cataracts, damage to plants, and the reduction of plankton populations in the ocean. Estimates of how quickly the ozone layer will regenerate vary by about two decades. NASA estimated in 2006, that it wil take to 2068 for the ozone layer in Antarctica to recover to the level before human-induced thinning. According to the World Meteorological Organization, the state of the ozone layer over Antarctica will not change noticeably in the next twenty years. The state before 1980 will be reached between 2060 and 2075, 25 years later than predicted in 2002. Over the Arctic, there will be bigger losses in ozone over the next fifteen years, esp. in cold winters. For the Arctic regions, the state before 1980 will be reached around 2050. ↑ Andino, Jean M. (21 October 1999). "Chlorofluorocarbons (CFCs) are heavier than air, so how do scientists suppose that these chemicals reach the altitude of the ozone layer to adversely affect it?". Sci. Am. ↑ Dobson, R. (2005). "Ozone depletion will bring big rise in number of cataracts". BMJ 331 (7528): 1292–1295. doi:10.1136/bmj.331.7528.1292-d. PMC 1298891. PMID 0. This page was last changed on 22 February 2018, at 17:21.